He is the most popular person here. Every square foot of Mathura-Vrindavan is wrapped in timeless devotion to Lord Krishna, the evergreen hero of Hinduism, the lover of Radha, the cowherd-prince and the re-incarnation of Lord Vishnu. Mathura without Lord Krishna is like Bethlehem without Christ. Welcome to Braj bhoomi or Krishna-land. Braj Bhoomi is the land where Shri Krishna was born and spent his youth. Today it has little towns and hamlets that are still alive with the Krishna legend and still redolent with the music of his flute. Mathura little town on the River Yamuna was transformed into a place of faith after Lord Krishna was born here. Vrindavan, a village - once noted for its fragrant groves, is where he spent an eventful youth. There are numerous other little spots in the area that still reverberate with the enchantment of Shri Krishna. The city of Mathura, in Uttar Pradesh, the nucleus of Braj bhoomi, is located at a distance of 145-km south-east of Delhi and 58-km north-west of Agra. Covering an area of about 3,800-sq-kms, today Braj bhoomi can be divided into two district units - the eastern part in the trans-Yamuna tract with places like Gokul, Mahavan, Baldeo, Mat and Bajna and the western side of the Yamuna covering the Mathura region that encompasses Vrindavan, Govardhan, Kusum Sarovar, Barsana and Nandgaon. The land of Braj starts of from Kotban about 95-kms from Delhi and ends at Runakuta, which is known specially for its association with the poet Surdas, an ardent Krishna devotee. Vrindavan, around 15 km from Mathura, is a major place of pilgrimage, on the banks of Yamuna. Attracting about 5 lakhs pilgrims every year, it is noted for its numerous temples- both old and modern. Vrindavan is synonymous with the innocent mirth and child like playfulness of Shri Krishna. Vrindavan, the dusty little town known for the temples, big and small, famous and remote strewn all over the place. Built in 1864, it is one of Vrindavan's most popular temples and famous all over India. The Deity of Banke-Bihari was discovered in Nidhuvana by Swami Haridasa. A contemporary of the six Goswamis, Swami Haridasa known for his devotional Bhajanas, was the guru of the famous musician Tansen. Built by the International Society for Shri Krishna Consciousness (ISKCON), it is one of the most beautiful temple of Vrindavan. The principal deities of this temple are Krishna, his brother Balram and Radha (Krishna's consort.) Adjoining the temple is the samadhi of Shri Prabhupada, the founder of the ISKCON sect, built in pure white marble. Hare Krishna devotees from all around the world flock here, bring a truly international flavour to this ancient holy city. Manasi Ganga Kunda is traditionally the starting and the end point of the circumbulation of Govardhana Hill. 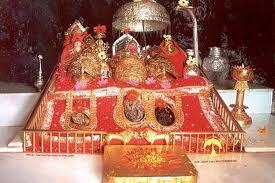 In the Mathura-Mahatmya it is recommended that one bath in Manasi Ganga and then take Darshan of Hrideva. This Kunda is considered a million times more potent than the Ganges River, because by bathing in the Ganges River one gets liberation and by bathing here one achieves "Krishna Prema," love of Krishna. There are 25 holy Tirthas (bathing places or Ghats) in Mathura. Vishram Ghat is in the middle and there are 12 more in the south of Vishram Ghats and 12 Ghats in the north. Those in the south extend to Moksa Ghat. Some pilgrims take bath in all 25 Tirthas before beginning Braj Mandala parikrama. Asi Ghat, Prayaga Ghat, Chakra Tirtha Ghat, Krishna Ganga, Dhruva Ghat and Vishram Ghat are still known by the same names. This famous temple was established by Srila Sanatana Goswami and was the first temple to be built in Vrindavan, which at that time was just a forest. The original Deity of Madana-Mohana was taken to Karauli in Rajasthan for safety during the attack on Vrindavan by the soldiers of the fanatical Muslim Emperor, Aurangzeb. One of Vrindavan's most opulent temples, it was built by the Maharaja of Jaipur, Swami Madhav, in 1917 after 30 years of labour. The fine hand-carved sandstone is of unparalleled workmanship, the huge pillars that hold up the roof are each carved from one solid rock, and the intricately fashioned marble on the altar is reminiscent of the Mughal period. The Maharaja financed the railway line that connects Vrindavana with Mathura, just for the purpose of hauling the huge pieces of sandstone used in the temple construction. The deities worshipped here are Sri Radha-Madhava, Ananda-Bihari and Hansa-Gopala. Another very popular temple of Vrindavan whih was founded by Harivamsa Goswami, who started the Radha Vallabha sect emphasizing devotion to Radharani. In this temple, there is no deity of Radharani, but a crown has been placed next to Krishna to signify her presence. The original temple of Radha Vallabha was destroyed by the Muslims in 1670 and a new temple was built beside the old one. The Seva Kunj is where Lord Krishna once performed the Raaslila with Radha-Rani decorating her hair with flowers and her lotus feet. Radha and Krishna would sometimes spend the night here, dancing with the Gopis and enjoying transcendental pastimes. There is also a small temple dedicated to Radha and Krishna's pastimes called "Rang Mahal". This is one of the most important temples in Vrindavan. The original deity was hand carved by Rupa Goswami and given as a gift to his beloved disciple, Jiva Goswami, who later built a temple here. Formerly this spot was in the middle of Seva-Kunj and it was the Bhajana ( where he sang devotional songs ) place of Rupa Goswami. This is the famous temple of Gopala Bhatta Goswami. Radharamana means "one who gives pleasure to Radha", and is one of the many names of Lord Krishna. The wooden sitting place (Hoki) and shawl (Chaddar) or Lord Chaitanya, that He gave as a gift to Gopala Bhatta Goswami is kept in this temple. Built by Raja Man singh of Jaipur in 1590, The temple is a testimony of the architectural splendour of medieval India. The temple walls average 10 ft. thickness. The upper state is regular triforium. Originally seven storeys high, it's upper four storeys were destroyed during the reign of Aurangzeb. The Krishna idol was then removed to Jaipur. Shivaji Temple was constructed in the year 1860. It is a prominent temple of northern India. It is famous for it's splendid art architecture , sculpture and twelve single piece spiral columns made up of marble approx 15' high. 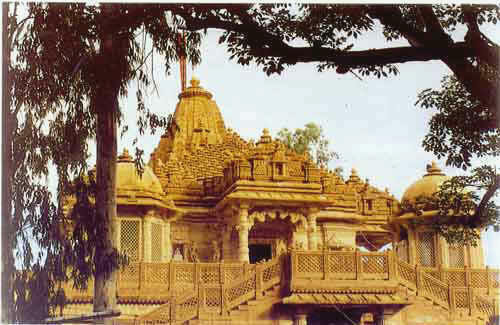 The world famous "Basanti Kamra" is situated in the eastern wing of this temple. This room has spectacular ancient chandeliers and rare paintings are available . Vrindavan 's longest temple, it was constructed in 1851 by Seth Govind Das ji & Seth Laxmi Chand Ji. 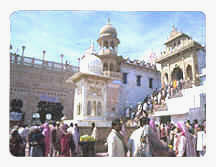 All were deciples of Acharyavarya Rangdeshie Swami where the main gate is in Rajput style. The temple follows South Indian architectural pattern . The outer wall measure 773 Ft. and encompass a water tank, a garden and the actual temple. The "Dhweja Stambha ", 50 ft. tall, is believed to be gold plated . Govardhan is situated 26-km from Mathura along the road to Deeg. It is named after the name of the "Govardhan Hillock" which is said to have raised on the finger and was was put in the condition to save the people from the incessant rain which fell constantly for seven days to destroy the people of Braj. The hillock is 7 Miles in length. The temple of Har Deva Ji in Govardhan town is 400-yrs-old. The Mansi Ganga which is an artificial lake, was constructed my Man Singh of Jaipur. The dense shady trees the hill ranges and tranquil flow of Mansi Ganga all unite together and make a charming view which the visitor can never forget. Kusum Sarovara is a 460-feet-long lake with the platforms going out 60 feet into the water. A 25-minute walk from Radha Kunda, it is the best swimming spot in Braj. Legend has it that the Gopis would pick flowers from here for Krishna. After going to Radha Kunda one can spend a relaxing hour here. 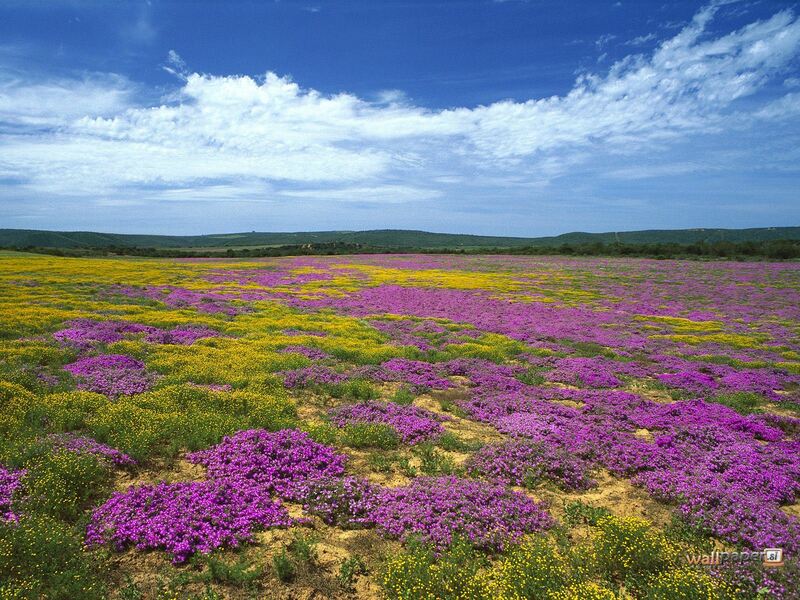 It is a peaceful place, where many people do not visit. The Ghats at this Kunda were built by Jawahir Singh around 1764. 5-kms to the north of Govardhan is Radha Kund, a village clustering around two small lake. It is said the Lord Krishna himself bathed here in self-purification. Between Govardhan and Radhakund is seen the cenotaph of Raja Suraj Mal Bharatpur who sacrificed in 1763. In front of the cenotaph is an artificial lake with an extensive garden behind. At the foot of a hill 51-kms north-east of Mathura is situated the venerable village of Nandgaon. It is known as the home of Lord Krishna's foster father Nand, in whose memory a spacious temple stand on the brow of the hill. Probably built in the middle of the 12'th century by Roop Singh, it consists of an open nave with choir and sacrarium beyond. Standing in the center of a paved courtyard, it is surrounded by a lofty wall which commands an extensive view of the Bharatpur hill and the level expanse of Mathura District as far as Govardhan. About 15-kms of the south-east of Mathura connected by a metalled road is Gokul, a suburb of the inland town of Mahavan on the bank of the river Yamuna. Gokul is a celebrated spot where Lord Krishna was reared in secrecy by his nurse. This place is very scared and is visited by thousand of pilgrims particularly during the birth anniversary of the Lord Krishna in July-August and the time of Annakut festival. Gokul is also associated with the famous saint Vallabhacharya who lived here for many years. The most important temple is that of Gokul Nath Ji. The principal meals are Janma in Bhadon and Annkut on the day after the new Moon of Kartik. The "Trinavat Mela" is also held on the fourth day of the dark half of kartik. Lying on the left bank of Yamuna, Mahaban is 4-kms from Gokul on the road to Sadabad. Lord Krishna is believed to have been craddled in this place. The largest and most sacred temple is that of Mathura Nath an edifice built of rock and plaster. Overhanging the Yamuna at Mahaban is an old building which is identified as the place of Nanda 9-kms from Mahaban on the same route is Baldeo which is another place of pilgrimage. These places can be visited by taxi or auto. There is a bus service to Baldeo. Baldeo is about 9-kms from Mahavan on the road leading to Sadabad. In the center of the town stand the famous temple of Baldeo or Dauji, the elder brother of Lord Krishna. Two annual fair are held at Baldeo. One on the Sixth day of the light half of 'Bhadon' called "Deo-Chhath" and other on the full moon of 'Aghan'. There is not a single day in the course of the year in which the temple court are not occupied with Pilgrims. Mathura, the land of cows, is famed for its milk based sweets. A variety of mouth watering savouries are also well known specialties of the town. Like the famous "Mathura Pedas" are famous in whole of India. When one takes a stroll in the city he comes across some nice hand made embroidery design typically reflecting North Indian culture. Last but not least Mathura being the birthplace of Lord Krishna, one comes across numerous sculptures, portraits, paintings, rings & Malas not only dedicated to Lord Krishna but almost of all deities. The rings, Malas, holy pendants come in all sorts of shapes & sizes from real smaller ones to real big ones and local markets are flooded with these articles.